Today I’ve got a message for you that’s near and dear to my heart. Remember that band Mae? If not, it’s cool, but they were a big part of my musical life. And for the last three records they put out, Mae was a self-managed band from top to bottom. Lead singer Dave Elkins has learned his way around the music business, made mistakes, seen the dark side, and is now laying a new foundation for doing things the right way. His project is called Schematic. It’s broken into the four “pillars” you see in the picture above. While three of these are already up and running, the Schematic Community is currently looking for a jumpstart. I’ve heard a lot of talk about changing the music industry. About taking leverage away from major labels and empowering direct artist-to-consumer relationships. But this is new. This time the focus is on enabling financial sustainability for artists who never attain national notoriety. It’s the idea that any passionate musician should be able to find like-minded fans and continue to produce material at whatever rate and for however long they wish, without going broke. The campaign ends Sunday, December 2 at 11:59pm. This is accomplished by, for instance, offering tools and training to artists through Schematic Management. By giving them fair contracts through Schematic Records, which won’t turn a profit unless the artists do first. And by making connections through the Schematic Community. First of all, the “cut” that we take comes from net receipts not gross. This is fundamentally different! We only take money on a profit. If you get paid $100 to play a show and it costs $100 in gas to get to the next city/venue we will never commission. Bands have to be profitable in order to be commissionable at Schematic. Via Kickstarter, Pledge Music, Indiegogo, etc. you keep all of your money and at Schematic, you keep ALL of your money. We help you spend that money wisely and help you build that business plan to be successful and accomplish your goals, help you build new ones, while we utilize the Schematic Community to grow your fan base and provide new opportunities. At Schematic Records, we only provide licensing opportunities which means you continue to own your masters and benefit from a larger royalty. After our term together, you own your masters completely. So if you sell a song online for 99 cents, you profit 99 cents. While we are doing business together, you’ll still make substantially more while we provide marketing, management, career growth and artist development. We will mainly be splitting royalties 50/50. You won’t find this anywhere else! One of Schematic’s primary responsibilities will be to connect Community members together to provide needs and other opportunities. For example, if you are a band getting ready to record a full length album, you will have plenty of needs to make your release a success. From photography to graphic design. From a producer to a lawyer to an agent. The list goes on and on and Schematic will connect the dots with you and help your network grow. We will provide work and trade and connections that will live within your budget, grow your brand, and sustain quality and integrity. Schematic will eventually become a community for all creatives. We strive to make this business model effective for all types of artists! From creative writers to audio engineers to illustrators to actors. This community will rely on talent, methodical planning and growth, and cross pollination. If it moves you, donate. Spread the word. The campaign ends Sunday, December 2 at 11:59pm. According to a recent update, the goal is about $15,000 closer than it may appear to be, so don’t be discouraged. 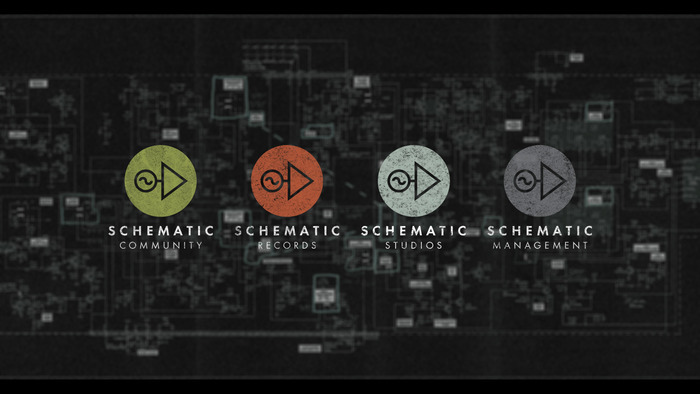 Here are Schematic’s main website and facebook page. Here are two bands currently working with Schematic: Asker (pop-rock from Minnesota), Treehouse (socially conscious hip hop from Chicago). Here’s some other online coverage featuring interviews with Elkins: Six Picks, I Am Tuned Up. Thanks for reading. Go check it out! And don’t forget to tell your friends. If you’re a believer, then you are the Schematic Community.